Our Cruise collection this season has been inspired by ‘T91’, the renegade or the Cowboy Tiger who has charted an incredible journey out of the Ranthambhore National Park and Tiger Reserve in Rajasthan, India after a turf war. We first chanced upon this young male tiger on a trip to the forest last summer. Having followed his journey, set amongst the back drop of the beauty of the forest, our print story comes alive with the flora and the fauna of Ranthambhore juxtaposed against the stunning architectural motif of the ‘Chhatri’. A canopy like structure, typically found in Mughal and Jat Architecture these ‘Chhatri’s’ in sandy pink, dot the national park amongst the ruins of the old fort and forms the perfect resting place for the elusive tiger. Easy and chic with a laid back sense of glamour, our cruise collection packs in an ideal travel resort wardrobe taking you from beach to city to safari chic. Verandah’s fabrics for the season include our specially woven ultra luxe cotton voile, cotton silk, crepe, charmeuse, pleated georgette, jute and upcycled denim. Hand beaded luxe kimonos and kaftans, painstakingly hand knotted Macrame jackets and our pleated and relaxed hand beaded separates in varied hues and colours of the forest bring our collection to life. Our Runway show this season, also debuted a menswear collection, in cotton silk and ultra soft linen with signature prints. On visits to the forest and tracking the journey of T91, our attention drew close to Tiger Watch, a non - profit organisations. Tiger Watch work tirelessly at the grassroots level to track tigers, monitor biodiversity and works on the anti poaching effort while alongside rehabilitating families and providing livelihoods. 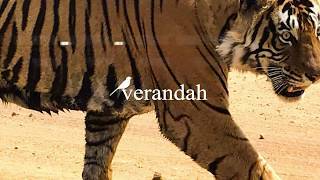 We at Verandah, touched by their efforts, have committed 10% of profits on global sales to Tiger Watch as part of our social responsibility effort and to support eco-tourism. Our campaign was shot at Sujan Sher Bagh, a luxury Relais & Chateaux property in the heart of Ranthambhore whose promoters are key supporters of Tiger Watch and a pioneering force in Tiger conservation in Ranthambhore. Our boho luxe, travel chic cruise collection is an ode to life in the forest and the elusive T91.